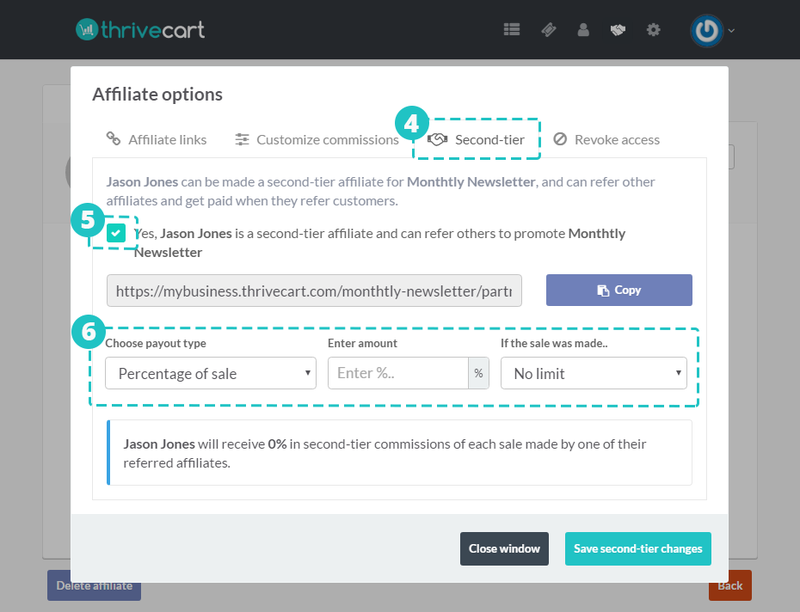 ThriveCart’s affiliate platform proudly offers you the ability to create 2nd-tier affiliates. In case you don’t know what 2nd-tier affiliates are, it’s essentially the ability to reward an affiliate for bringing more affiliates on to promote your product. It’s great to reward ‘team leaders’ or if you have an affiliate manager who is in charge of recruiting additional affiliates and you want to give them a cut on sales these affiliates make. How do I enable second-tier affiliates? Enabling 2nd-tier affiliates is as easy as a couple of clicks. 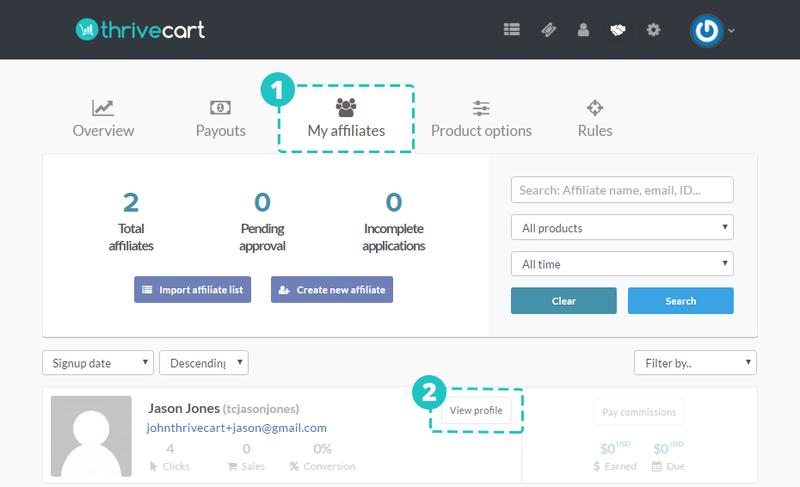 From the affiliates area in ThriveCart, click on ‘My Affiliates’ then click on ‘View Profile’ for the affiliate to want to enable 2nd-tier on. Next, we want to choose which product they can drive affiliates to, and we want to click on ‘Affiliate options’. From the modal window that opens we want to go to the Second-tier tab, then enable this option. We will be shown the link they can use to sign up affiliates with. This will also be available from their affiliate dashboard. We can choose a payout type, either a percentage of the sales or a fixed amount. We can enter the amount they are to earn on each sale their affiliates make. We can also set a time limit on how long they are eligible to receive a commission on the affiliates they’ve recruited sales. You sell a product for $100. Your affiliate commission is set to 50%. You have Jason, who is an affiliate, and he is in charge of recruiting affiliates. In return for recruiting affiliates, you are going to give him a cut on the sales they make. You decide to give Jason 10% of sales his referrals makes. So Jason emails his list and new affiliates register under his sign-up URL. One new affiliate is called John. John makes a sale. He gets 50% commission as this is what your product base commission is set to pay out to affiliates. Jason is also going to receive 10% commission because he referred John to promote your product. This leaves you with 40% of the sale for yourself. 50% to affiliate (John) + 10% to 2nd-tier affiliate (Jason) + 40% to yourself = 100%). You may have an affiliate whose signed up from your main affiliate registration page but actually needs to be associated with a 2nd-tier affiliate. You can easily add a relationship between to the affiliates so your 2nd-tier affiliate will then earn their cut of commissions for sales the affiliate brings in. You’ll want to go to the affiliate profile of the affiliate who should be associated with the 2nd-tier affiliate. If you click the pencil icon, you will be shown a modal window with a list of all 2nd-tier affiliates for this product. You can then select the 2nd-tier affiliate you wish to associate with this affiliate. Once you’ve selected the 2nd-tier affiliate you want to associate with this affiliate and click save, the system will have you confirm the relationship and inform you that any sales the affiliate now brings to the platform will earn the 2nd-tier affiliate commission on these sales too. Once finalised and the relationship is confirmed you will now see the 2nd-tier affiliate as the referrer. Should you need to change or remove this 2nd-tier affiliate from being associated with the affiliate you can do so by clicking their name and then either removing the referred 2nd-tier affiliate or selecting a different 2nd-tier affiliate.